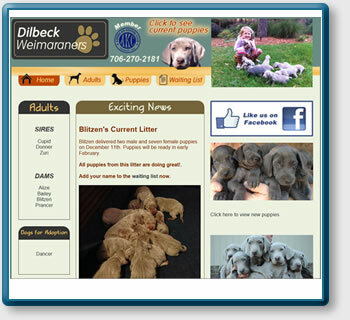 Dilbeck Weimaraners specializes in beautiful AKC and Pedigree litters of Weimaraners. The owner was looking for a way to showcase his puppies to prospective owners. Since I had already designed a website for his successful landscape business he asked to design another site for this business. Since first creating the site the business has grown considerably. The owner now takes videos of his puppy litters and uploads them to YouTube. I embed the YouTube video into his website. As a result visitors to his site can easily and quickly view the latest information on a particular litter of puppies. They can pick out thier very own puppy and watch him grow until the puppy is old enough to be take to its forever home. This website has made it much easier for the owner to show off his dogs and puppies. It has enabled him to sell his puppies much quicker.